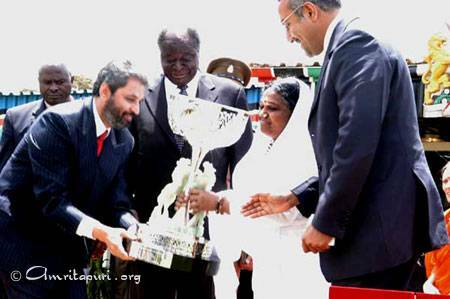 Her Holiness Sri Mata Amritanandamayi (Amma) presented the prestigious Gandhi-King award for Non-Violence for the year 2003 to His Excellency the President of Kenya, Hon. 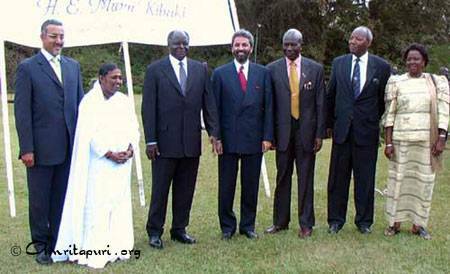 Mwai Kibaki, today at the State House Gardens, Nairobi, Kenya. 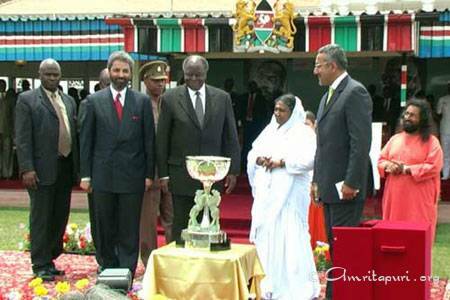 Also present were the First Lady Her Excellency Mrs. Lucy Kibaki, the Honourable Vice President Mr. Moody Awori, the Honourable Minister Mr. Najib Balala, for Culture, Sports and Social Services and Bawa Jain, the Secretary General of the Millennium World Peace Summit. The Kenyan Cabinet members and many special invitees were also present on this momentous ocassion. 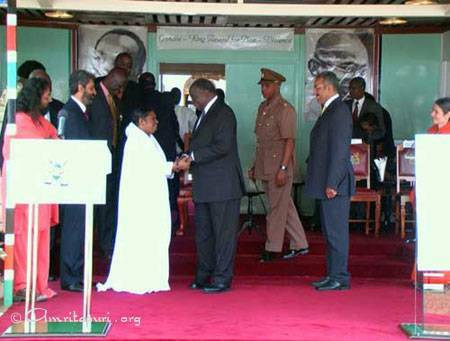 The gathering was addressed by Amma, Mr. Balala, Mr. Jain, and His Excellency the President. Earlier in the morning Amma had a private meeting with the Honourable President at his residence. 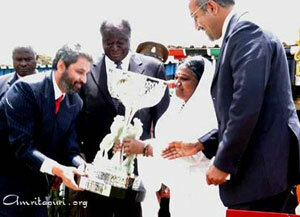 Amma praised President Kibaki’s reforms and the introduction of free primary education in Her presentation address. Accepting the award, Mr. Kibaki praised the World Movement for Non-Violence and the Millennium World Peace Summit for their role in the promotion of peace, and paid tribute to the previous award recipients, which include Amma, UN Secretary General Kofi Annan, former South African President Nelson Mandela and renowned primatologist Jane Goodall. On Her arrival in Kenya on the 22nd, Amma was welcomed at the Nairobi airport by the Honorable Minister Najib Balala MP on behalf of the Kenyan government. “I am really glad that I attended this course. I am very thankful to you for giving me this opportunity and I intend to practice meditation regularly. Thank you” – Seshamni K.
Question: Amma, you went through a lot of suffering in your childhood. When you see people suffering, do you remember those days? That woman had worked all her grownup life for the sake of her children. Her health had deteriorated because of all her hard work; and now, when she was old, emaciated and bedridden, no one bothered to take care of her. There was no one to give her a glass of water when she was thirsty. Amma brought her food from home and fed her many times. Many elderly people are neglected in this way. Their sons and daughters, who as children prayed that their parents would live forever, now, when they are grownup and have families of their own to take care of, look upon their parents as a burden and a nuisance. They long to get rid of their aged parents, for they loved them only for as long as they could gain something from them. If someone has a cow, they love that cow because it gives them milk. But as soon as the cow stops giving milk, they get rid of it. It was by observing these things that Amma came to understand that all worldly love is rooted in selfishness; people love each other only for the sake of their own selfish gains. Thus it was through witnessing the suffering and the hardships people had to face that Amma learned about the nature of worldly life. When poor people get sick, they visit government hospitals. They have to wait for hours in a queue to register their names. When they have finally been examined by a doctor and given a prescription, they have to worry about where to find the money to buy medicines. Amma has met many people in that situation. Most of the people in this neighbourhood can barely make two ends meet with the little they manage to earn each day. If they get sick or bedridden, they have no money for food or medicine. Amma as seen people who were writhing with pain but had no money for painkillers. Just one tablet would have sufficed to ease their pain, but they couldn’t afford it. Because of this they had to spend the whole day in extreme pain. Amma has also seen a lot of children worrying because they didn’t have enough money to buy the paper on which to write their exams. She has seen people sewing buttons on their shirts with thorns. Thus Amma has seen and heard and experienced the suffering and hardships that people have to undergo in their lives. This knowledge prompted Her to look within. Everything in the world became Her Guru. Even a tiny ant was Her Guru. Because Amma shared the sorrows and suffering of the poor when She was a child, She is now able to understand people’s pain and suffering, without them having to explain anything. Quite a lot of these people come to see Amma every day. If Amma’s wealthy children made up their minds, they could alleviate the suffering of these people to a great extent. Amma would like to urge Her wealthy children to be compassionate and serve the people who are poor and suffering. 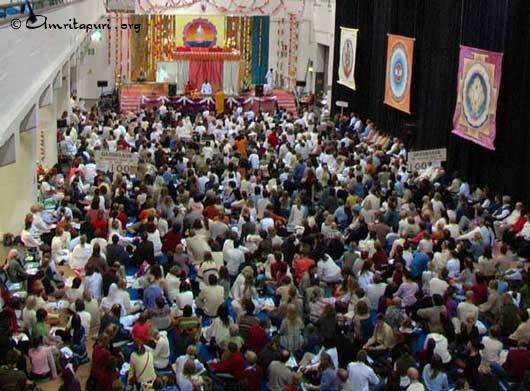 Amma’s visit to Helsinki, Finland, was the talk of the whole country, as thousands gathered for Her darshan at the Cable Hall. It was Amma’s fifth visit to this beautiful Scandinavian country. On the morning of the first day’s programme, the Bishop of the Orthodox Church in Helsinki, Rev. Ambrosius, met Amma and got Her darshan. Rev. Ambrosius told Amma that he had visited the Orthodox Church in Kerala 10 years ago. He was happy to see how Amma received each and every person who came to Her with the same love and compassion; he was also pleased by the hug that Amma gave him. The Cabinet Minister of Cultural Affairs in Finland, Ms. Tanja Karpela, also came to meet Amma during the first evening programme. She was full of bliss after Amma’s darshan, and was very impressed by the charitable activities that the ashram was carrying out worldwide. Amma’s visit to Finland was reported on the Finnish TV’s main news and in the national newspapers, Helsingin Sanomat and Iltalehti, which have very wide circulation in this country. During Amma’s visit, the translation of Judith Cornell’s biography of Amma into Finnish was also released. The evening darshan during the second day went on until 5:00 am the next day. That afternoon, as Amma was entering the airport to board the plane for Barcelona, She was received by an airport officer who had a pen with Amma’s photo in his pocket. When asked, he said that he had really wanted to see Amma, but because of his official duties, he couldn’t make it for the programmes. His friend had given the pen as a souvenir and he cherished the gift. His face was beaming with a smile as he received Amma’s hug. Question: What is the way to overcome desires so that we householders can get closer to God? 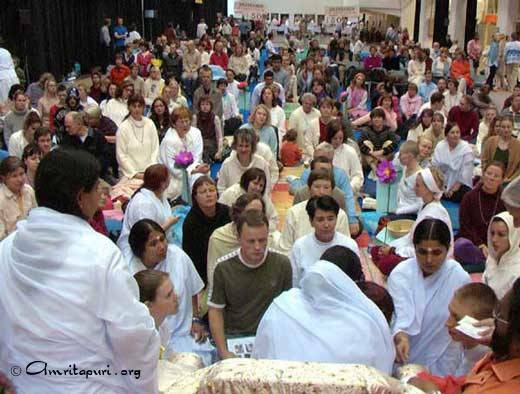 Amma: The only way is to understand that each and every object that you desire is riddled with pain. If the desires are not controlled now, later they will control you, and eventually they will swallow you. Mother doesn’t say that you must give up all desires. You can enjoy them, but don’t think that this life is only for that. Strong determination is needed. “While driving one must obey traffic rules and regulations. If not, accidents will occur. Not only you, but others will suffer if an accident happens. Likewise, while driving the vehicle of life along the road of this world, you have to adhere to certain laws, certain do’s and don’ts. It is these rules and regulations that the Gurus and the scriptures talk about. If you follow them, you can avoid danger and will be safe both in your personal life and social life. However, conflicts and calamities will arise in both areas of your life if you break these rules and regulations through overindulgence and other undisciplined ways.